Thanx for all ur lovely words!! Danke ihr seid die besten!! 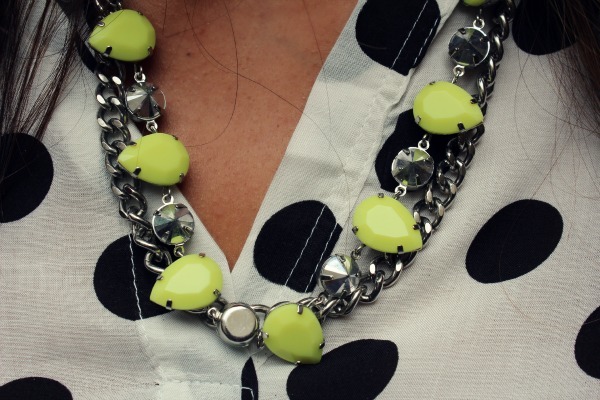 such a lovely outfit :) those neon details are fab! Really feminine and chic...Love the polka dots blouse! Echt toll, die Kette und die Schuhe sind ein Traum! Amazing <3 I love that your heels aren't that high, it's a nice detail. The neon color is such an unique color! das outfit steht dir wunderbar! einfach toll!!! folge dir! sorry, now in english! your outfits is so beautiful! just amazing! I´m following! it would be great if you visit my blog and leave me a coment ! Sehr schönes Outfit! Besonders die Schuhe passen toll dazu. Du bist so so hübsch! perfecto outfit. love your style!!! gratulation zur veröffentlichung bei instyle.de :) und danke für´s folgen!!! die heels sind wirklich von New Yorker? Wunderschön! That's a perfect end of summer look! I love all about it : shoes with a neon touch, black skirt, blouse and black bag! Perfect! Wunderschönes Outfit!! Ich liebe die Bluse und die Tasche!! I love this look, that blouse is perfect!! Your blog is so fantastic, i love it. I like your outfit so much.